The amazing thing about the phenomenon that is Stranger Things is that everyone loves a different aspect of it. Some people watch it for the incredible monsters, others for Joyce's standout performance (Winona forever); many love the boys' relationship, while some are strictly Dad Steve fans. But everyone, everyone, loves Eleven! She is inarguably the glue that holds the whole series together. So whether your prefer Mike or Dustin (we're team Dustin) or you feel like Max's character added anything to Season 2, we bet you're head over heels for the telekinetic girl that unites an entire audience! To you, El will always be the scared, waffle-eating girl in the pink dress and jacket, using her powers to save Hawkins (no matter how punk she tries to become). That's why this Eleven Stranger Things Blue Jacket Adult Costume is necessary to finish off your Halloween costume! It looks just like the one from the show and demonstrates your affection and respect for the original iteration of the coolest character on TV. You've already got the baby-pink dress with the Peter Pan collar; you've got the knee socks, the sneakers, and even the blonde wig. And you look positively Eleven-esque. But in order to completely nail your costume, you need this blue lightweight jacket to go on top! It has a front zipper and will look best for your role with a bit of dirt n' grime on it. This jacket will help keep you warm as you head out to that Halloween party, and proves clutch in crafting an authentic version of Eleven's signature Season 1 look! 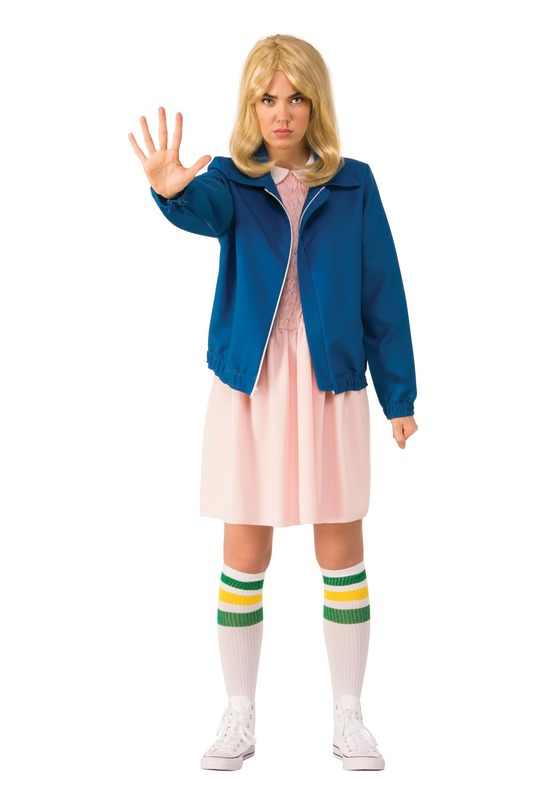 We would never lie to you—the truth is that you look just like Eleven in this powerful look. Thank goodness you have this jacket; you'd never want to be seen as second-rate Eleven wannabe. Nope, it's the real deal for you! We're happy to see you taking your power so seriously.